Wednesday August 1st. 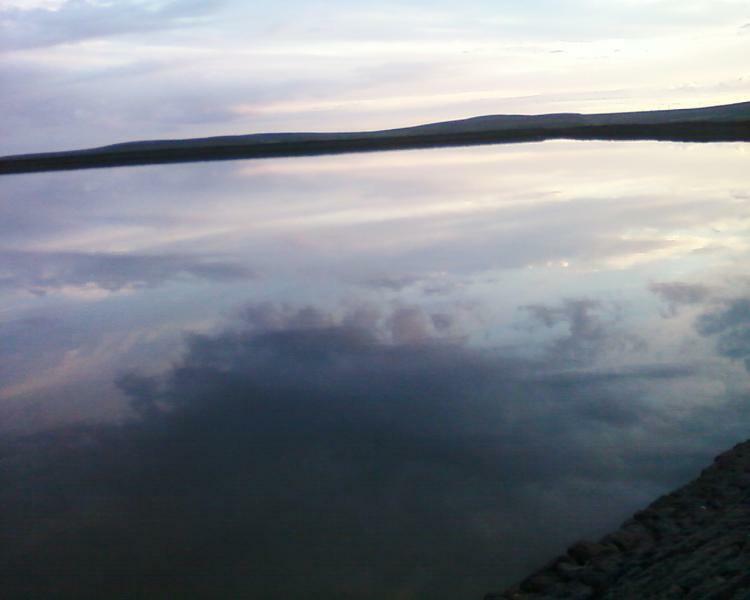 Reservoirs and Edges. 14 miles (exactly) from Ogden Reservoir. Leader: Mike Lee. 12 walkers and 2 dogs. Twelve people and two dogs set off from the Ogden Reservoir for a circuit of the Saddleworth hills with a decidedly wet weather forecast hanging over us. Leaving the Piethorne reservoirs behind us we climbed up to the Rams Head on the Ripponden Road and on to Readycon Dean Reservoir. 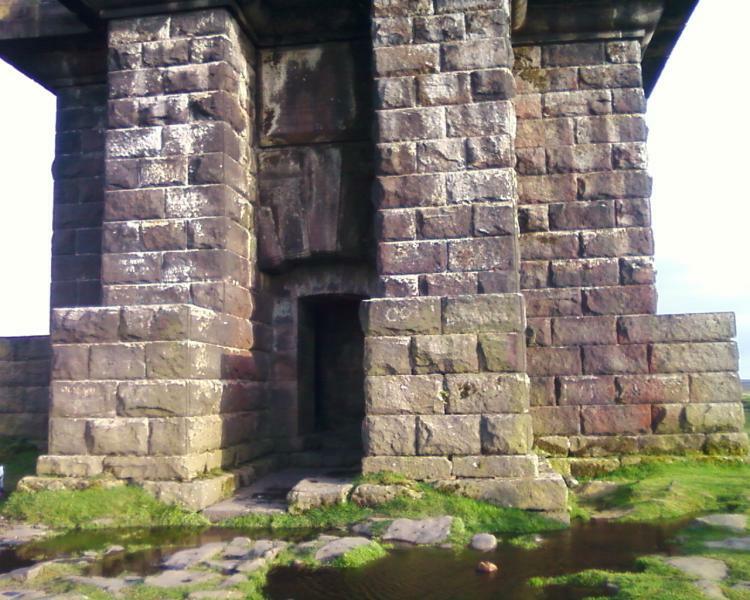 From there another short climb took us to our morning coffee stop in the shelter of a wall with views out over the Dowry Reservoir and the Tame Valley. Descending to the Dowry Reservoir we crossed the Huddersfield Road and followed the Pennine Bridleway and Oldham Way to join the Pennine Way path along Standedge. 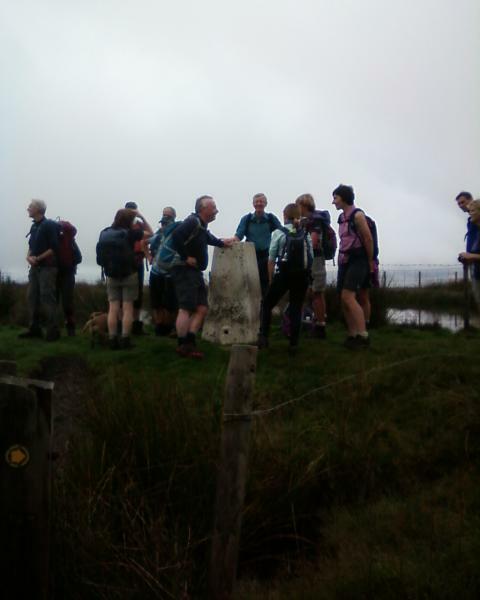 The forecast rain still did not materialise as we traversed the edge and paused to view the plaque commemorating the Saddleworth poet and writer Ammon Wrigley. From Standedge we descended along the Standedge Trail to the site of the Roman Fort at Castleshaw. Not much remains of the fort except earth banks, but these provided us with shelter from one of the few showers of the day as we sat down to lunch. The shower was brief and the sun ignored the weather forecast and made an appearance as we left the fort and followed Hull Brook down into the village of Delph. Beyond Delph, we climbed steeply up to Badger Edge from where we had extensive views back over almost all of our route. Then it was on to Grains Bar and Crompton Moor, before descending through picturesque Ogden hamlet and back to the car park, where Heather’s GPS logged the distance at 14.0 miles. She strenuously denied suggestions of a fix from those who seem to assume (perhaps based on recent experience) that walks never conform to the advertised distance! Other members seemed more interested in the ascent involved, which turned out to be 1600 feet. Sunday August 5th. Three Halls and a Castle. 19 miles from Kendal. Leaders: Dave and Alma Walsh. 19 walkers and 2 dogs. A short incline across the road from the car park took us on to the north end of Scout Scar. The morning was humid & we had views of the Levens Valley below us & Morecambe Bay in the distance. Down off the Scar we passed Helsington Church & followed tracks & fields to our morning break stop of Sizergh Castle. From the castle we made our way over fields to the pretty village of Levens & then through further fields to our first hall of the day Levens Hall with its fine Topiary garden which we could just about see over the stone walls. Following the banks of the River Kent we walked through the grounds of Levens Hall & sighted black fallow deer & a herd of Bagot goats. Crossing the river on the outskirts of Sedgwick we then followed the river on the other side back to Levens Hall. The next hall on the list was Hincaster Hall a grade 2* listed building which was reached via fields & a muddy enclosed track. Through Hincaster village (so small you would miss it if you blinked) & lunch on a grassy slope with fine views. The sun even came out. Over half way round now we went through another pretty village Sedgwick, & our final hall of Sedgwick Hall now apartments, but previously a school & prior to that owned by the Wakefield family who owned the gunpowder factory in the village. Picking up the river Kent again we walked to the outskirts of Kendal before heading away from the river & through a tunnel under the A591. A climb back up Scout Scar again we returned to our starting car park after admiring the views from the mushroom viewing shelter. A good day weather wise as despite thunder rumbling & dark skies around us during the afternoon we managed to stay dry all day Thanks to everyone for making the lengthy trip to the lakes. Thank you to John Jocys who has sent the pictures on the link below. Tuesday August 14th. Moss Bank Evening Stroll. Leader: Ann Oliver. 9 walkers and 3 dogs. The last summer evening stroll was on a lovely warm evening. Leaving Moss Bank Park and Peter Haslam who was busy with the BMF, we strolled up to and through the lovely hamlet of Barrow Bridge. 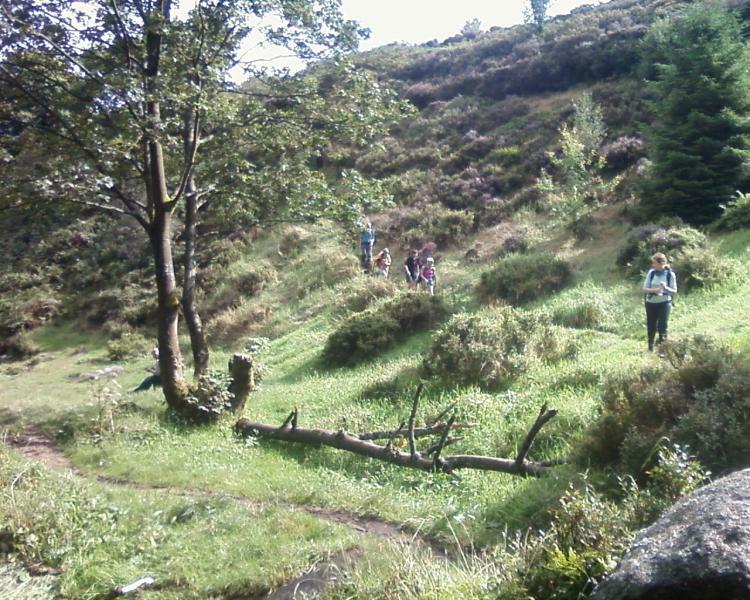 The chapel was open for quiet prayer but there wasn't time to linger as the steep hill up to Scout Road awaited us. The views across the plain were slightly hazy but all the landmarks such as Jodrell Bank, Frodsham, Beetham Tower etc could still be seen. We looked to see if the ice cream parlour at the farm was open but no luck tonight. Never mind, Ann had brought plenty of sweets to make up for the disappointment. Moving along to Horrocks Wood we strolled through this pleasant area and down to the outskirts of Smithills country park. Crossing the road we by passed a farm with a very noisy dog and dropped back into Barrow Bridge. From here it was but a short way to the outskirts of Moss Bank Park and across back to the cars. This was the last summer stroll, thank you to all the walk leaders and to those who have supported the walks. Wednesday August 15th. The Heritage Trail, Stage 2. Please see write up under Heritage Trail on the main menu. Leader Norman Thomas. 16 walkers & 1 dog. Before the off Norman explained the title of the walk. The Bittern is a member of the heron family some of which reside at Leighton Moss which we would visit on our walk. He also added he would donate a pound of his own money to the first person to hear the boom (mating call) of the bittern. 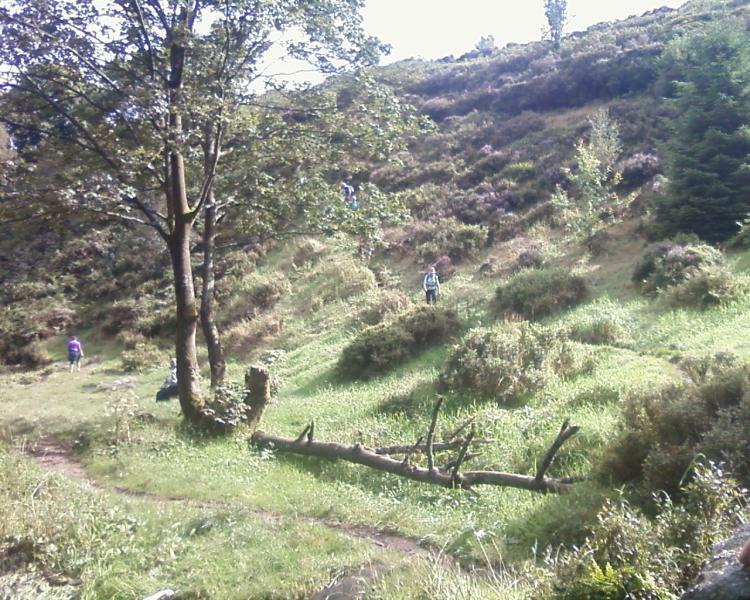 From the car park we headed up a steep slippy track that led us to the top of Warton Crag. This afforded us fine views of the estuary & the town of Carnforth. Our next point of interest was Leighton Hall closed for the day but of no matter to us as we made our way down to Leighton Moss.We walked in near silence ears straining hoping to hear the "boom of the bittern" but to no avail. We pressed on to the RSPB visitor centre for morning break. Over Silverdale Golf Course past Arnside Tower & up onto Arnside Knott. Dropping down into Arnside we had lunch in the rain with views somewhat limited now of a train passing over the River Kent Viaduct. Scrambling over rocks with the water lapping at our feet we made our way along the coast in a southerly direction before an afternoon break at Jenny Browns Point after passing through a very posh caravan site. Not far to go now we travelled along a grassy causeway to Crag Foot and then back to Warton with the rain coming down heavily. A quick drink in the George Washington pub & then home. Normans pound remained firmly in his pocket. He forgot to mention the Bittern only booms in spring. Thank you to Dave for the pictures. Sunday 26th August. Todmorden Treat. Up to 28 miles. Leader: Steve Clark. I’d planned the walk in the hope of encouraging people who hadn’t completed 28 miles before and wanted the chance to do so. I also hoped to get everybody round who wanted to finish it and this was pretty much achieved. It was lead at what I hoped was an accommodating pace. I felt lucky the walk had not been run the day before, when we’d had so much rain and that it wasn’t being run the following day with yet more rain forecast: today held the prospect of some dry, still and sunny weather. 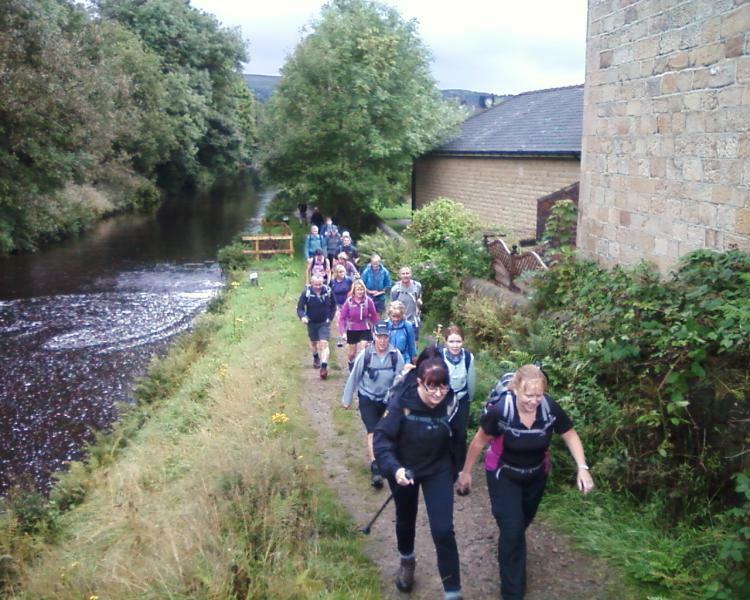 Starting at the car park on Stansfield Road, Todmorden, 23 walkers and a dog gathered for the start of a 28 mile route around Todmorden. 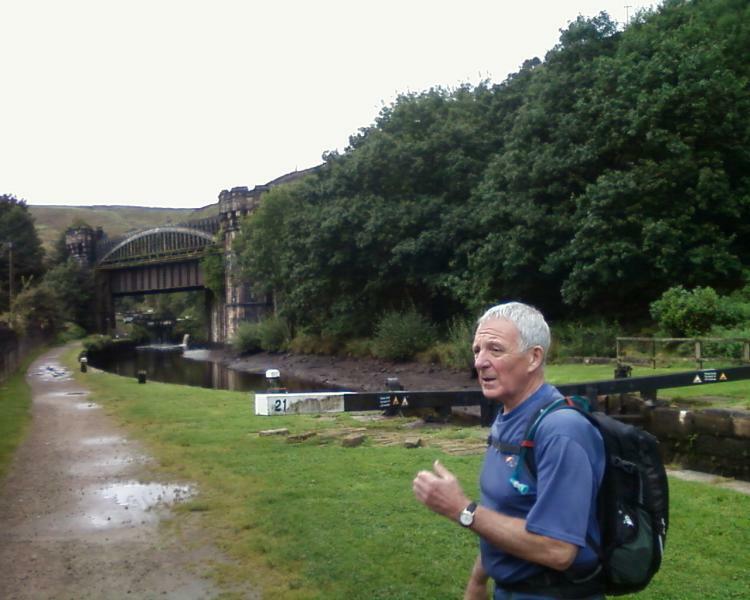 We set off just after 08:30 gently warming up with a mile along the Rochdale canal to Gauxholme. Leaving the canal we initially zigzagged up the side of the valley before continuing to climb towards the trig point at Trough Edge End. By the time we arrived at the trig, we’d climbed 1,000’. Time for a group photo. Over the wet moorland now, enjoying the quiet and solitude of this fairly desolate place we headed over Limer’s Gate to the Bacup road. Turning northwest we made our way to Thieveley Pike, stopping briefly to enjoy the view, before dropping down towards Buckley Wood where we enjoyed a coffee break in hazy sunshine. Dropping down to the Burnley road we crossed and then started to climb towards the wind farm on Black Scout. Continuing along the edge, we came out on a minor road above Cornholme. Here, three of our party and our only dog decided it was for the best to head back to Todmorden, when it became apparent that Helen was feeling poorly. On past the old house at Hartley Royd, Hudson Bridge and then to Whirlaw Stones high above Todmorden. Here, at 13:30, we took our lunch and it started to rain lightly. We also provided the midges with their lunch. Pressing on the rain became a little heavier: passing Great Rock, the ancient house at Hippins (date above the door: 1650) and then up to Blackshaw Head. The rain had passed over by now and the sun had come out to play. 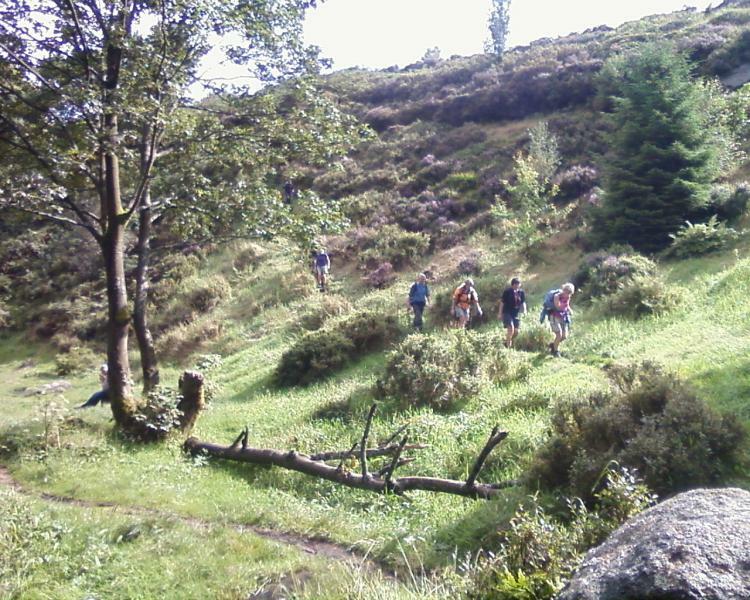 The western end of Cluden Clough was crossed and then up to Slack. From here a gentler descent into Hardcastle Crags was used in place of the steep and treacherously slippy descent used on my original reccy, although this added a little to the overall distance of the route I'd decided this was the better and safer option. With toilet facilities being available, an afternoon tea break was taken at Gibson Mill. The stepping stones were covered with water and invisible. Lower down the valley the steeping stones I’d intended to use up to the scout camp were also impassable and so we continued down the valley to Midgehole. From here the ascent to Heptonstall was made. Wandering through this ancient village we dropped down and once again found ourselves on the Rochdale canal which was followed for a mile going west to Eastwood. 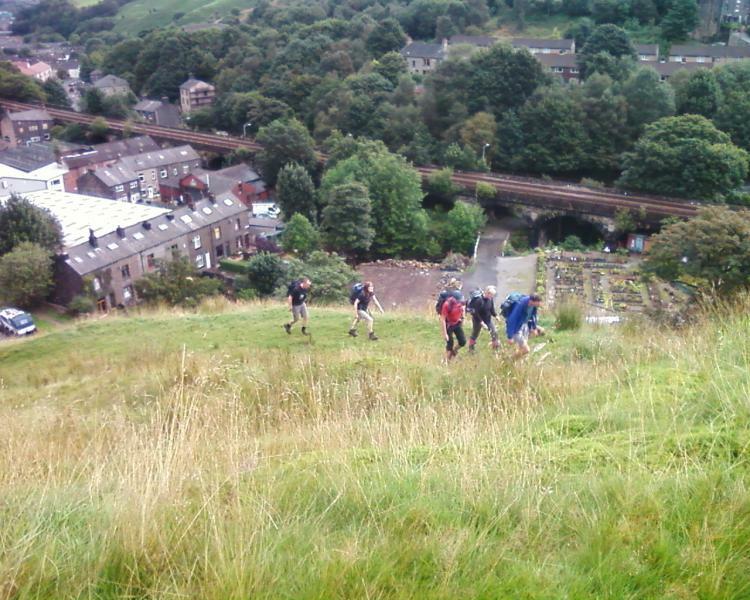 This was the last cut-off point for anybody not wishing to complete the climb to Stoodley Pike. Everybody went for the climb. A brief stop was taken half way up to the Pike to take on food and liquid. Everybody made the Pike in fine style. 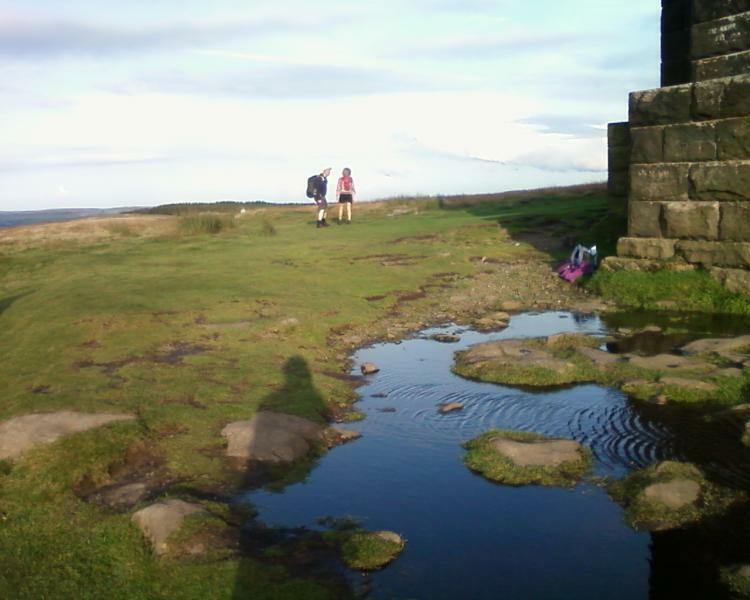 We returned to Todmorden taking the high level route passed Gaddins Reservoir. 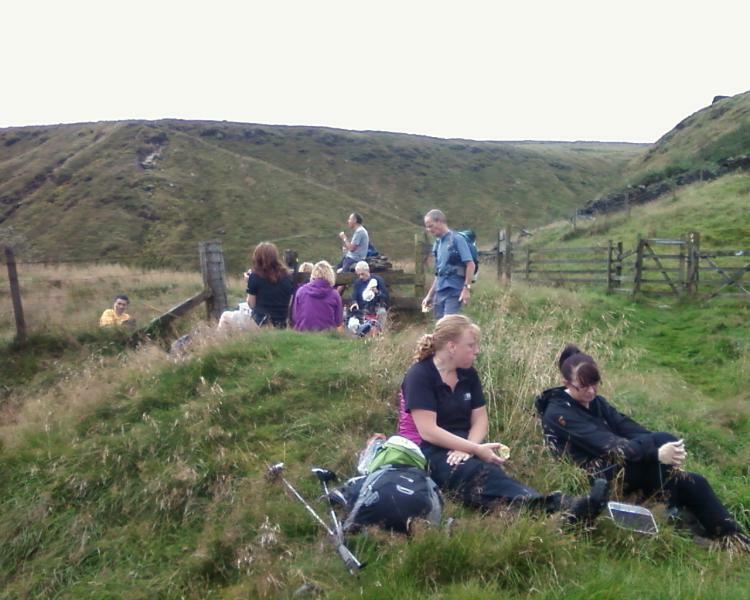 On the way between the Pike and the reservoir we waited for a while whilst one of our newer members, Gillian, who had suddenly become hypoglycaemic, fed and rested a little. 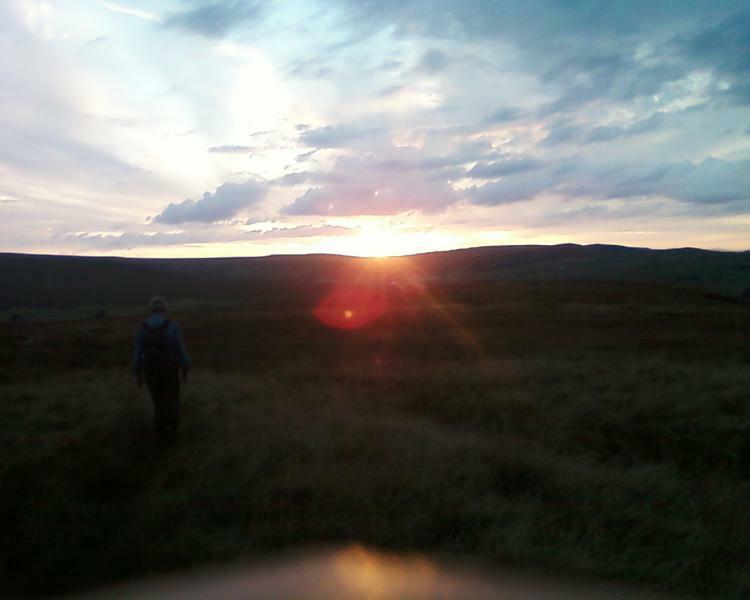 Les (Calderdale group) very kindly volunteered to take Gillian back by a safer route via Mankinholes, whilst the rest of the group made the reservoir then back to Todmorden to beat the encroaching dark. We finished around 20:35. Several of the group recorded their first 28 mile walk, including Gillian, as the actual distance travelled on the day was 29.25 miles. Well done Gillian, well done all. Average moving speed: 2.9 mph. Please click on link below for some pictures from Hazel.